Hello Quick Quotes readers! 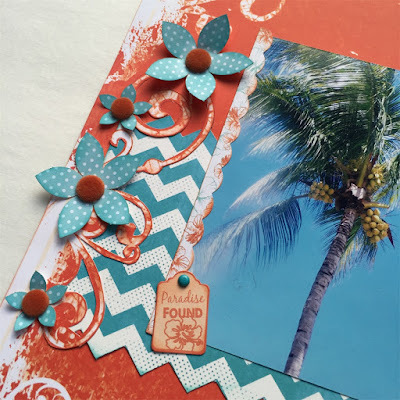 Alicia with you today and I have a tropical layout using the Catalina Island collection. 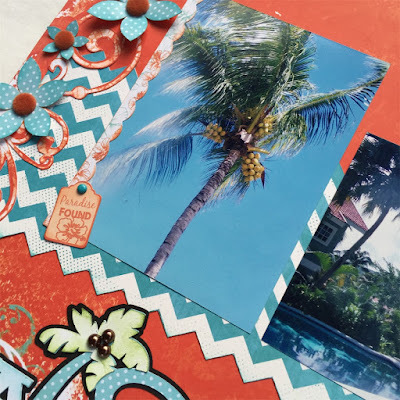 I just can't get enough of the bright cheerful colors and they go great with my honeymoon photos from Jamaica. I fussy cut the zig zag on the Catalina Island 300 AND used the scrap at the top for a little more diversity from the orange. Doesn't that blue sky in my picture pop on the bright orange paper? I also fussy cut the flourishes from the Catalina Island 200 and tucked the end of the Catalina Island 300 paper underneath. I added die cut flowers from a previous Club Q Kit and embellished them with brads. 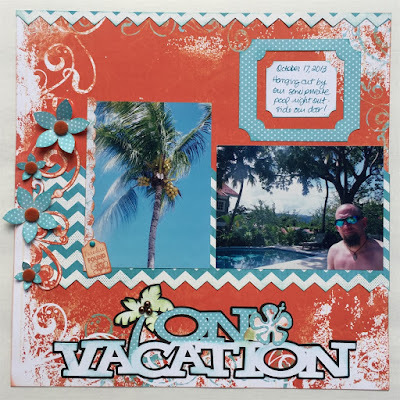 I used a piece from Catalina Island 100 that was pretty much entirely white for the journal spot and the leaves of the palm tree on the title. Then I took my Green with Envy - PowderPuff Chalking Ink and inked it up. I topped it off with some chocolate pearls for coconuts.